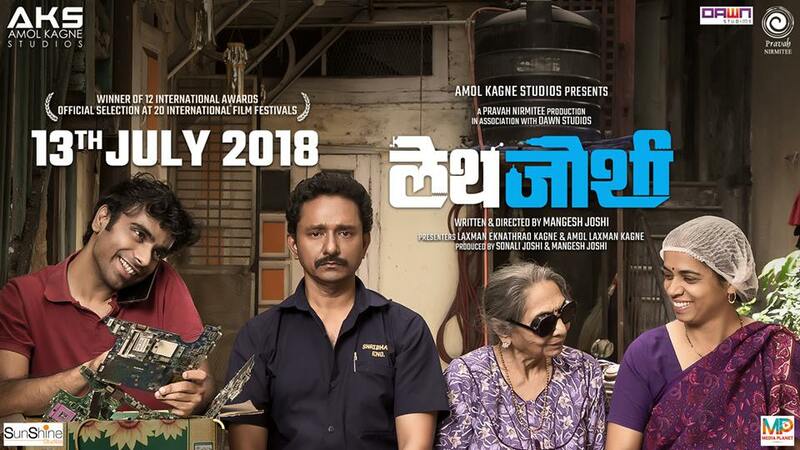 In the second half of the film, our protagonist Vijay Joshi (Chittaranjan Giri) rides his humble bicycle to the sprawling bungalow of Mr. Sathe who’s the owner of his workshop from which he has recently been laid off. A guard accosts him at the gate telling him that being bed-ridden due to illness, Sathe is not entertaining any visitors. Joshi has worked diligently at the workshop for 35 long years and knows that the boss acknowledges his contribution. Yielding to Joshi’s persistence, the guard makes a call to Sathe’s home from the gate. After Joshi lets Mrs. Sathe know over the phone that he wants to have a word with her husband, she asks Sathe if he’s willing to meet a certain Vijay Joshi. We then see Vijay hearing his boss’s answer – “Oh is it Lathe Joshi? Please let him come.” And, our protagonist smiles for the very first time in the film. It’s just a slight stretch of the lips, but it’s enough to notice that he is feeling a resurgence of pride in himself. The beauty of the film lies in this ability of it being able to evoke an emotion, without seemingly making much of an effort or say quite a bit, without apparently saying much. It’s this minimalistic approach that makes even a tender smile soar so high. Operating a Lathe machine is a job of high skill; it is a sculpting of sorts. Vijay Joshi has worked on it for more than three decades with the dedication of an artist. But automation has meant that the workshop, comprising of him and few other such highly skilled workers, has to shut down. Yes, it does sound like a plot tailor-made for a tearjerker, but you would be pleasantly surprised to find that it is anything but that. Lathe Joshi is more about how in this age of automation the cost and quantity of any product is taking precedence over its quality, in the process disregarding the craft that highly skilled workers possess. Joshi restlessly looks for another job, unlike his other deposed colleagues who, at their age, find contentment in praying all day. But wherever he goes, he finds that there is a demand for an operator of an automated machine, but not for a Lathe worker like himself. The family on the other hand isn’t entirely dependent on him financially. He sees the wife run a catering business which is seeing a steady growth as she doesn’t think twice before providing her customers even with Chinese food (Indianised, of course), though her specialty is authentic Maharashtrian cuisine. His son’s street smartness has meant that his hardware repair business is also growing steadily. By contrasting Joshi with his wife and son, the film lays bare how compromise and a bit of hustling have to be second nature to thrive in today’s competitive world that chooses quantity over quality. On his last day in the workshop, Joshi is seen working for a longer time than usual, just so that he can finish the piston that he is so carefully working on. He then later presents the piston to his boss Sathe who values the craft behind it. The movie Lathe Joshi, too, is very much like this piston. In an industry where films seems to be made senselessly in bulk on an assembly line, it is a rare finely crafted piece of art. In this age when attention deficit disorder seems to have become an epidemic, director Mangesh Joshi shows great courage in letting his scenes breathe by staying on them for just a tad longer. There’s no spoon feeding here, he lets the visuals speak for themselves. Vijay Joshi’s refusal to compromise just in order to conform with the society’s demand comes across starkly when we see him in a wide shot riding his bicycle away from the old wadas of Pune, towards the humongous ultra-modern IT parks that lie on the city’s periphery, with large SUVs and other four-wheelers passing by him rapidly. Every time he goes into this modern Pune, he is also shown crossing one of the old bridges that run over the Mula-Mutha river. The changing family dynamics also come through rather subtly, unlike in the TV serials that Joshi’s visually impaired mom is hilariously addicted to. When the son buys a new car, Joshi is seen sitting behind, while his wife sits ahead, next to the driver’s seat. When there isn’t enough place in their modest home to keep the materials that the son requires for his business, the family conveniently assumes that it is the now unemployed father who will adjust by sleeping in the verandah. Often I find myself cringing at the loud background score in Marathi movies, but here it is sparsely used to underline only the most crucial moments. But we are treated to a careful designing of sounds originating from the film’s world itself that lends the film a beautiful texture. Chittaranjan Giri’s performance is a sort of a primer in understated acting. Joshi might seem like a timid man, but there’s a steely resolve underneath that comes across beautifully. Other members of the cast too don’t overdo their roles, complimenting each other beautifully in the process. In this age of maha gurus and maha aaratis and maha this and maha that, when nothing is presumed to be big enough unless and until a big show is made out of it, a minimalist beauty like Lathe Joshi is a rare gem that needs to be cherished. ← Soorma Movie Review: The Goal Rush!